To use WinWedge with any of the macros on our website, you must first setup WinWedge in DDE Server Mode. Each of our example macros requires different DDE settings. As you read through this guide, please keep in mind the settings on the page of the macro you wish to use. When you select "DDE (Server)" from the Mode menu, a window will appear prompting for a DDE Application Name, a DDE Topic and a DDE Command. In addition to sending the serial data, WinWedge can be configured to issue a DDE command to another program after each input from a serial device is received. The DDE command is typically used to force the program that is receiving the data from WinWedge to perform an action like running a macro or subroutine. For example, if you were to specify Excel for the DDE Application Name, System for the DDE Topic and [RUN("MyMacro")] for the DDE Command, WinWedge would force Excel to run a VBA subroutine named "MyMacro" after each data record is received. The information that you supply in this window is used to specify the DDE Command Processor for the program that will receive the DDE command from WinWedge. 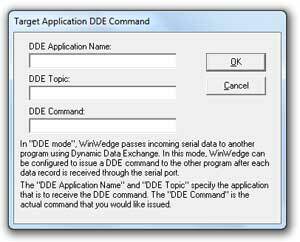 Note: This information is needed only if you intend to configure WinWedge to send a DDE command to the application, otherwise it can be cleared out or simply left as is. Select "DDE Server" from the WinWedge "Mode" menu. Enter the DDE Application Name and Topic. If using a macro from our website, this information is on the webpage for that macro. If you're using WinWedge Standard, enter the DDE Command in the appropriate field. For users of WinWedge Pro (and older versions of Software Wedge), go back to the main WinWedge setup screen and select "Input Record Structure" from the "Define" menu. If you have not done so already, define the data record structure for your device. In the last window titled "Input Record Definition Editor", you'll notice a textbox called Field Postamble DDE Command after each of your predefined fields. This allows you to send multiple DDE commands to your application, instead of just one in WinWedge Standard. If you are just using a single macro to handle your data (and are therefore only sending a single DDE command), navigate to the last defined field and place the DDE Command in the Field Postamble DDE Command textbox. Activate WinWedge. Note: If you have not yet finished setting up WinWedge, follow our Quick Start Guide for step by step instructions.